The launch of the Mobility Analytics Research Group (MARG) was made possible by one of the first Federal Highway Administration Exploratory Advanced Research Program (EARP) projects that was awarded in 2008. Professor Ram Pendyala served as the principal investigator for the project. The project was titled "Modeling the Urban Continuum in an Integrated Framework: Location Choices, Activity-Travel Behavior, and Dynamic Traffic Patterns". This project resulted in the development of a "Simulator of Transport, Routes, Activities, Emissions, and Land" dubbed SimTRAVEL. Other key faculty investigators who served on the SimTRAVEL project team included Professor Paul Waddell of the University of California at Berkeley and Professors Yi-Chang Chiu and Mark Hickman of the University of Arizona (Professor Mark Hickman has since moved to the University of Queensland, Brisbane, Australia). MARG team members, Professor Karthik Konduri, Mr. Bhargava Sana, Dr. Venu Garikapati, and Dr. Daehyun You were heavily involved in the project; they were graduate research associates and students at Arizona State University during the course of the project, and their theses and dissertations are largely based on work inspired by the SimTRAVEL project. 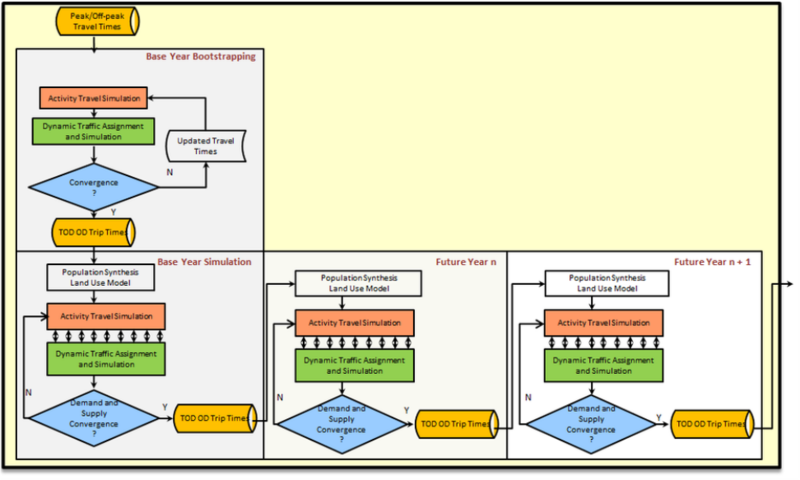 An overview of the SimTRAVEL framework is shown in Figure 1 below. The framework recognizes that there is a lagged effect in the relationship between land use development patterns on the one hand and network attributes (level of service) on the other. The SimTRAVEL integrated model system begins with a base year bootstrapping step or process. Network travel times (obtained through a standard network skimming process) are used to simulate daily activity-travel patterns for the entire synthetic population of agents. The resulting list of trips is input to the dynamic traffic assignment model; the dynamic traffic assignment model assigns the trips to the network and computes time-dependent network skims for an entire day. These skims are time-of-day based origin-destination trip times (TOD OD Trip Time). Time-dependent network skims are saved for each time slice of the day (the resolution of the time step is specified by the analyst and can be 5 minutes, 15 minutes, 30 minutes, or 1 hour), yielding a series of time-of-day based network skims. These updated skims (updated travel times) are fed back into the activity-based travel demand model. The activity-based travel model is run on the synthetic population using the new set of skims to generate activity-travel patterns for the population. The resulting trips are assigned to the network and the time-dependent skims are updated once again. The new time-dependent network skims are fed back into the activity-based travel demand model yet again to simulate activity-travel patterns, and the resulting trip list is input to the dynamic traffic assignment model for routing and simulation. This process is continued until a stable set of time-dependent network skims is obtained. When the time-dependent network skims no longer show appreciable change (within a tolerance level specified by the analyst) from one iteration to the next, the final set of skims is saved and the main model process is initiated. The bootstrapping process is merely aimed at obtaining an initial set of consistent time-dependent network skims that can be used to simulate activity-travel choices. The model system then proceeds to simulate land development patterns, activity-travel demand, and network attributes on an annual time step. Using base year census data and other socio-economic databases, the population synthesizer, PopGen, is run to generate a base year synthetic population. UrbanSim is applied to the synthetic population to determine a number of location choice attributes including residential, work, and school location choices for all individuals in the synthetic population. The activity-travel demand model, openAMOS, and the dynamic traffic assignment model, MALTA/DynusT, are then run in tandem in a tightly integrated dynamic framework. The two model systems communicate with one another and exchange data on a minute-by-minute basis for the entire 24 hour simulation period. At the end of a 1440 minute simulation period (corresponding to one day), the model system will output activity-travel patterns for the entire synthetic population together with link flows and link travel times (by time of day slice) for the entire network. Convergence checks are performed on both the demand and network modeling sides of the enterprise, and the model system is said to have converged only if both demand and network convergence occur. On the demand side, OD matrices are compared across iterations and convergence is said to have been achieved if the difference between iterations falls within a prespecified tolerance. On the network side, relative gap functions (typically used in dynamic traffic assignment models) are used to monitor and establish convergence. When both demand and network model convergence has been achieved, the final time-dependent network skims are saved. These network skims (attributes) are used to compute accessibility measures that affect land development patterns (real estate markets, housing development patterns, business location choices, household location choices) in the next (subsequent) year of the simulation horizon. The population synthesizer is run once again (based on an updated set of control variables for the subsequent year) to generate a new synthetic population for year t+1. Within each simulation year, the activity-based travel demand model and the dynamic traffic assignment model are run in tandem in a tightly integrated framework in an iterative fashion until convergence is achieved. The method of successive averages (MSA) is used to facilitate rapid convergence in the model system. The process continues from one year to the next; the converged network skims of one year affect land use patterns in the subsequent year, and the activity-travel demand and dynamic network models are run in tandem in each simulation year to obtain a new set of activity-travel patterns and corresponding network attributes. Figure 2 depicts the tight dynamic integration of the activity-based travel demand model with the dynamic traffic assignment model. Unlike many previous attempts at integrated modeling of travel demand and network assignment where the travel demand model and dynamic traffic assignment model are run largely in a sequential manner (similar to the bootstrapping step that serves as a precursor to the main simulation run), the SimTRAVEL framework developed by the team involves a tight dynamic integration of the activity-based travel demand model and the dynamic traffic assignment model. In each minute (or analyst-specified time slice) of the simulation day, the activity-based travel model simulates the set of trips that are going to depart in that minute. The activity-based travel demand model uses the time-dependent skims provided by the bootstrapping process for the first iteration of simulating choices that comprise activity-travel demand. The set of trips - with information about origin, destination, vehicle used, travel party composition, and trip purpose - is sent to the dynamic traffic assignment model. The dynamic traffic assignment model routes and simulates the trips on the network based on prevailing network conditions. In each minute of the day, the dynamic traffic assignment model returns (to the activity-based travel demand model) the set of trips that have arrived at their respective designated destinations. Thus, in each minute of the simulation, there is a two-way flow of information - the activity-based travel demand model is sending a set of trips that are departing in that minute to the dynamic traffic assignment model, and the dynamic traffic assignment model is sending a set of trips that have arrived at their destination in that minute. After a traveler arrives at the destination and the trip (traveler) is returned to the activity-travel demand model, the demand model simulates subsequent activity-travel choices such as activity episode duration, next activity and its location, mode choice, and travel party composition. All of the demand choices are simulated while considering time-space prism constraints, coupling constraints, household constraints, institutional constraints, and modal availability constraints as described in the openAMOS page. Through the tight dynamic integration of the demand model and assignment model, wherein there is perfect consistency between the temporal dimensions of activity-travel episodes and trip routing and simulation on the network, the model system avoids the problem of having "gaps" and "overlaps" in the final activity-travel pattern associated with each agent. The position of the traveler (vehicle) on the network is updated every six seconds, thus providing a high degree of resolution in depicting vehicular movements. By adopting this integrated modeling paradigm, SimTRAVEL constitutes a "continuous-time" activity-based travel model system with activities and trips simulated at the resolution of one minute. At the end of a simulation day, the new time-dependent link travel times are used to compute updated origin-destination travel times and time-dependent shortest paths. These updated network skims and time-dependent shortest paths are saved and used in the next iteration of the model run. The model is run iteratively until convergence is achieved on both the demand and network modeling sides of the enterprise. The method of successive averages (MSA) is used to facilitate rapid convergence of the model system. On the demand side, convergence is checked with respect to origin-destination matrices (OD matrices) and the change in OD flows is monitored across iterations to see if convergence has been achieved. On the network modeling side, standard relative gap measures are used to monitor and establish convergence. Once convergence is achieved, the final updated skims are saved and used to compute accessibility measures; these accessibility measures serve as input to UrbanSim for simulating land markets and household/business location choices in the subsequent simulation year. The iterative process implemented in SimTRAVEL may be considered to be reflective of an agent day-to-day learning process. Each simulation iteration may be treated as representing a simulation day, with the skims saved at the end of an iteration representative of the information that agents have acquired based on their day's experience. Through a method of successive averaging where the averaging favors information from more recent iterations, the model system is able to capture the day-to-day experience and learning processes of agents wherein more recent experience or memory is favored over older experiences that begin to fade from memory. Each iteration constitutes a simulation day, and the experience and information acquired by the agents (at the end of an iteration) is used to inform activity-travel choices in the next simulation day (iteration). An important distinguishing feature of the SimTRAVEL framework is that it is an agent-based simulation model system that embeds rich behavioral model components that reflect behavioral processes underlying activity-travel demand. The model framework facilitates the tracking of individual agents through time and space, and through both the activity-travel demand model and the dynamic network model. 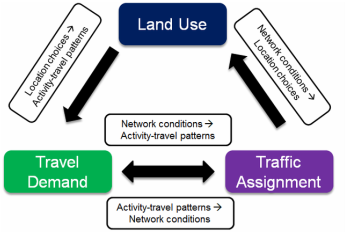 In many integrated modeling platforms, agents in the activity-travel demand model are not connected with or related to agents in the dynamic network assignment model. As the models operate in a sequential paradigm, the connections among agents in the two platforms are lost. However, in the SimTRAVEL modeling framework, the agents are tracked through the land use model, the population synthesizer, activity-travel demand model system, and the dynamic traffic assignment model in a very consistent manner. Each household, person, and vehicle can be tracked seamlessly through the various model components, thus ensuring consistency in representation of behaviors and allowing agent-based disaggregate analysis of activity-travel patterns. The original design of the tight dynamic integrated modeling paradigm may be traced to the work of the late Professor Ryuichi Kitamura, who presented this framework at the 2nd Transportation Research Board Conference on Innovations in Travel Modeling that was held in June 2008 in Portland, Oregon. For more details, please review his original presentation from that conference, which is based on an earlier paper in which he and his co-authors describe an integrated model system that tightly connects PCATS, a prism-constrained activity-travel simulator, with DEBNetS, a dynamic event-based network simulator.